Gosensations is happy to present you news, results and regular updates on Pandanet Go European Team Championship. This is an EGF-tournament where national teams play in a league system on the Pandanet-IGS server in the room EuropeanTeamChamp. The teams consist of up to 12 players, out of which four are selected to play in each round. For the first season, there are 30 participating countries in three leagues. There will be nine rounds, the first on November 22nd and the last in May/June. 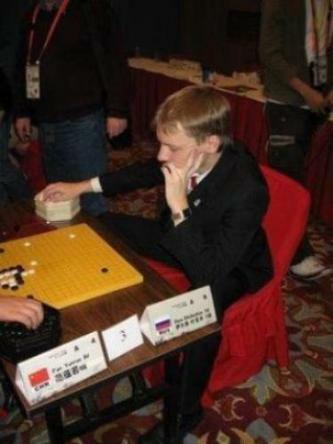 The finals, with the top four teams, will be held at the European Go Congress in Bordeaux in July 2011. The game between Russia and Hungary was very exciting. Top players gathered to present their country in the tournament. 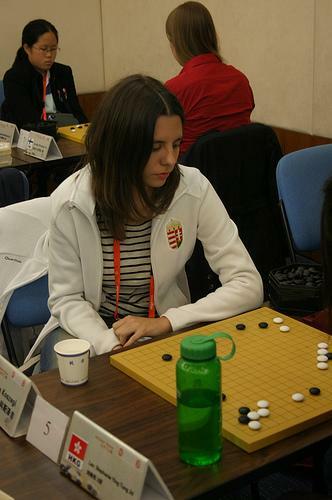 First game between Iliya Shikshin and Diana Koszegi attracted a lot of spectators. The fuseki was rather peaceful until B move 39. Black initiated fight in low right corner but result was not to her advantage. Iliya managed to get influence attacking White's group at the bottom and then the game was in his favourite style - using thickness for attack. After long fight in upper right corner, White was already ahead 10-15 points. So Black tried risky move B179. But Iliya was relentless and didn't pull back forcing Black to resign. On a side note, there were still some minor issues. The game between Oleg Mezhov and Rita Pocsai started one hour later than it was scheduled. The problem was that both players didn't know how to set even game. I believe there should be a referee who would help to resolve such issues. Also, I used GoPanda client to watch the game and couldn't find it! I had to download another client Glgo to finally be able to watch the game. Some players also experienced problems in getting to the server. I hope in future such games will be more organized and provided with live commentary at least for the top games. Source: Pandanet Go European Team Championship. Although the rules commision was in favour to count the games as in a class B tournament the Egf decided to only count it for the rating in the next season 2011/12. What do you mean by that? I took tables from their official site. And it was not only me several players didn't have these games while trying to use Gopanda client. So it was obvious bug of the program. If later they fixed the bug I'm glad. Please keep irrelevant comments to yourself or write news instead of me. It's always easy to be one criticizing. I didn't want to answer to your lack of manner post but since there is no moderator I have to. If you keep posting such posts I will ask Alex to remove your comments. Because of such people I have no desire to post news. Author doesn't know left from right? Are these games official (egf-ranked) ? Look at Matthew Macfadyen 6d вЂ“ Kamil Chwedyna 4d (Kamil) and its strange opening.